Just like for the zero to one million gold challenge I recorded a lot of my statistics while I was working on the gold cap challenge. Today we will take a look at them and see if we can learn anything. Before we dive into the stats I need to add a note on my accounts. I used two accounts for the challenge. Account 1 (A1) is the account I have my max level characters on. On this account I crafted, and played the game. Account 2 (A2) is where I have my bank character. I used this account for all my auction house activities. Since I spend a lot of time logged into both accounts at the same time it’s a bit hard to figure out exactly how much time I spent just from /played. For gold per hour and other per hour calculations I will use the average value of my /played for the two accounts. I spent 279 hours logged in on A1 and 337 hours on A2 for an average of 308 hours. As we can see my numbers were actually better in Legion than in BfA. This is caused by several factors, including the fact that the Legion numbers include an auction house that was in full swing in terms of having markets in stock. Deflation may also be a factor, but I think the major piece was all the stocking up I did in the beginning of BfA. My sales in BfA have been much higher, but with a lower overall profit margin, probably because the BfA numbers include the full cost of all my BoEs, whereas I already entered the challenge in Legion with a decent stock in BoEs. My sales per hour /played (measured in gold) are actually quite similar for both expansions, with a higher amount of /played since BfA launched. As we can see my Liquid gold was steadily rising for the first weeks of the challenge. I had some weeks with decreases where I did some serious shopping. 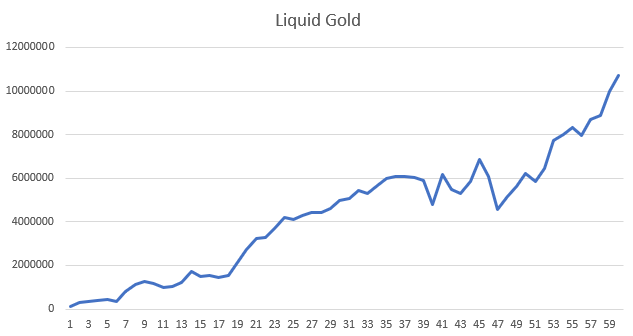 My liquid gold was quite slow for the first 19 ish weeks, then the rate increased heavily after I hit 2 million. Then I hit 6 million just before BfA. At that point i started building up a large inventory of BfA BoEs and my liquid gold stagnated and even decreased for a period of about two months. Then once I hit saturation in the BoE market my liquid gold pretty much exploded and I went from 5 million to gold cap in three months. As we can easily see this was a slog, but my overall time spent playing the game was not that high. On average I spent a little less than an hour a day logged in. The graph above shows the total value of my auctions. You can easily see the dip down around week 33 when I started selling off my Legion BoEs for cheap, followed by a sharp increase around week 39 when I started buying BfA BoEs and entering BfA markets. It then hit a peak around week 57 before I started cutting prices on my Uldir BoEs in anticipation for the next raid tier. At it’s highest I had 12 million gold posted on the auction house, while sitting on about 9 million gold liquid. 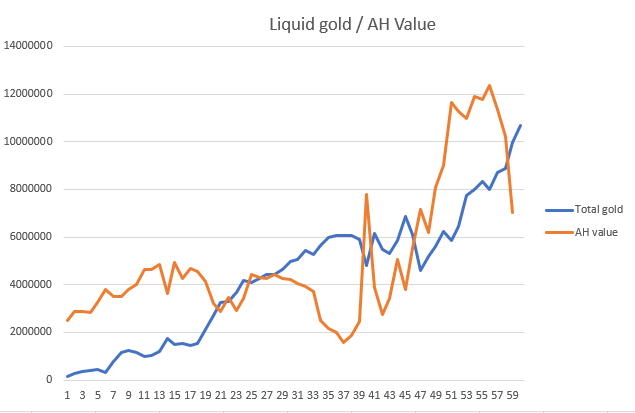 If we compare it to my total gold as below we see that large decreases in AH value typically coincided with large increases in my total gold. 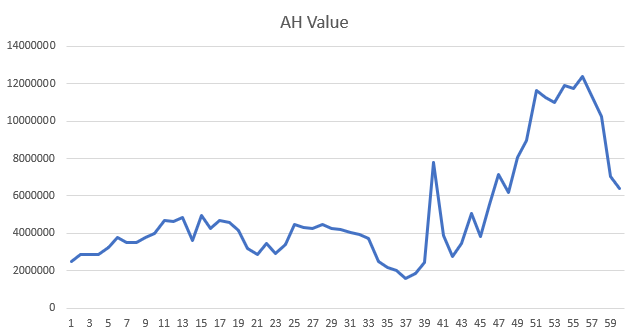 We can also see that after spending a lot of gold my AH value increased by a lot. 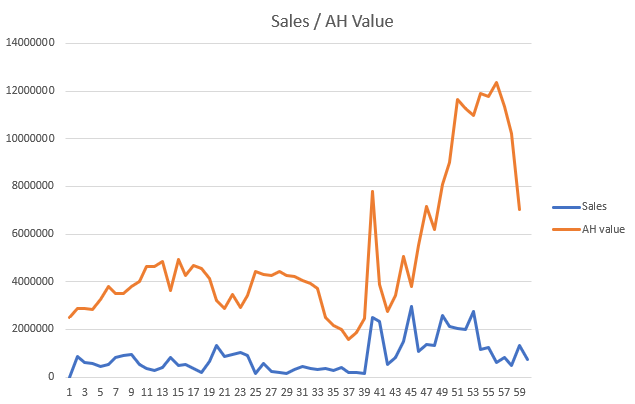 More stuff on the AH means more sales. We’re going to look at my weekly sales and how they compare to my weekly gold spent as well as my total auction house value. As we can see above the gold spent and gold made from sales mirror each other surprisingly well. Obviously these two factors are correlated as gold spent on good deals can and will transform into gold made from sales. 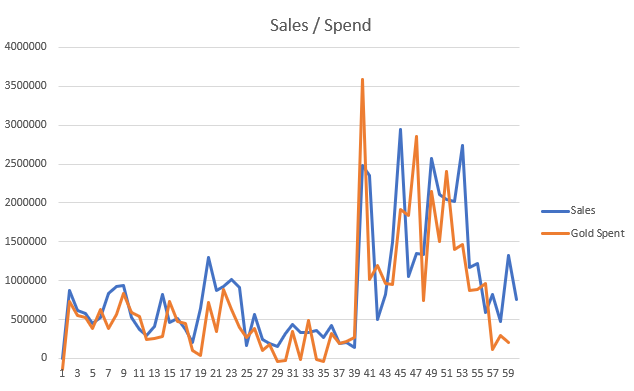 There is a feedback loop here of sorts where large sales will make me happy and lead me to spend more gold on deals as I have gold to spend, so we see that large spends lead to large sales and that large sales leads to large spending sprees. The correlation is about 0.77 which indicates a strong relationship between these two numbers. Next up we can compare my weekly sales to my auction house value. Once again we see that the two seem correlated. If we calculate the correlation it is 0.49 which is significant. Larger auction houses lead to larger sales, but the relationship is weaker than for gold spent. Some of this may be mispriced items, and some of it is the fact that single markets can be saturated. 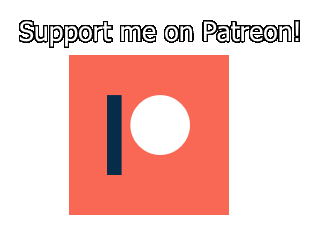 By this I mean that I may have posted more items than anyone will buy in a single posting cycle. Posting 100 000 herbs on the AH will probably not give you more sales than posting 10 000 herbs. I exported my accounting data from the TSM app to look at which items brought in the most gold. 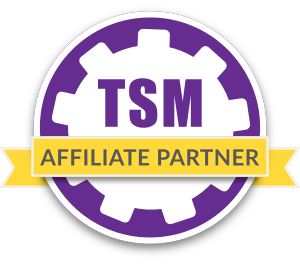 Calculating the overall profitability of groups is sadly not particularly easy and would require me to go through everything manually. (Please bring back the old group summaries to the ledger TSM team!). What I could find easily is a sorted list of the items I have sold based on sales. 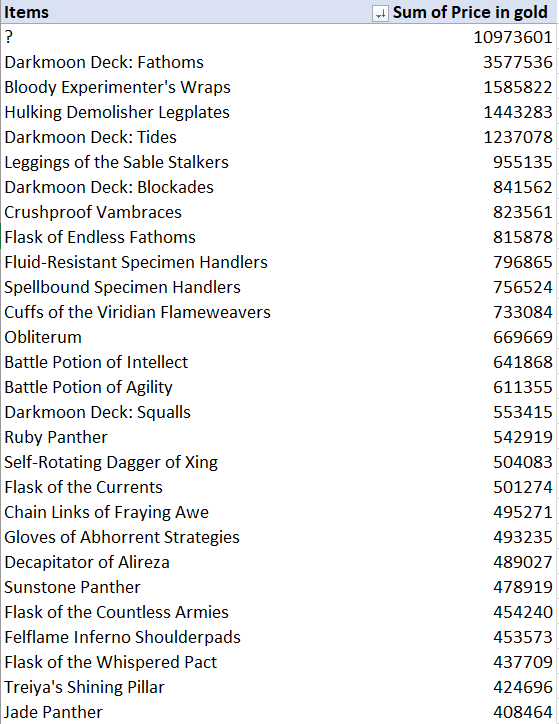 Below is a sorted list of the top 28 items in terms of total sales. As you can see the list is topped by “?” which includes a lot of the Legion BoEs (most if not all of the 101 BoEs), as well as some items I have no idea what are. I’m assuming the switch from TSM3 to 4 screwed up some of the name to item ID logic. After that we can see I made 3.5 million gold selling darkmoon deck fathoms. Then we have a mix of BfA BoEs, Darkmoon Deck: Tides. Then in fifth we have a Legion BoE, the Leggings of the Sable stalkers. Some other interesting items include three versions of the JC Panthers, as well as battle potions and Obliterum. High volume items can definitely bring in a lot of gold. Some cool items here include Masterful Argulites, which I’ve sold 382k worth of. The material I’ve sold most of is the Redtail Loach, and I’ve managed to sell Loaches worth a total off 263k gold since BfA launched. BoEs are undoubtedly the kings at bringing in large amounts of gold though, with a lot of different item names showing up in the list. I made a lot of gold throughout the challenge. On average I made enough gold to pay for a little less than a token a week with the current EU price. I’d say that’s pretty good. The challenge includes stuff like leveling and farming recipes, and I think a pure flipping approach would be even more efficient. Or if you already have all the recipes, as most of you will now likely be in a spot where you already have a lot of stuff unlocked. I’ve proven that goldmaking can be done, even if you don’t want to grind or spend endless hours a week playing the game. Hopefully you enjoyed following along and you picked up some tips along the way.